My intention is to upgrade my kitchen to cook for guests. Until then, I will post recipes here so as to share what’s to come and for general inspiration and interest. with burnt butter and sage from the garden. I’ve spent years in search of the best gnocchi recipe and finally found it in Mietta’s Italian Family Recipes cookbook. If you have been on a similar quest then you will know the questions are egg or no egg, oil or no oil. Then it’s the ratio of flour to potato. 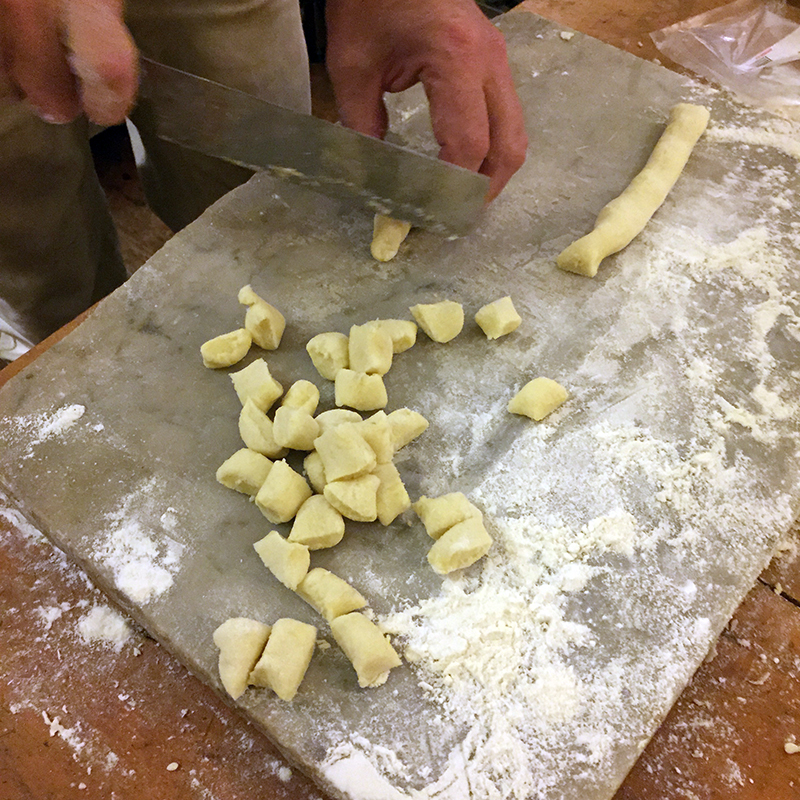 When you realise the that best is simply flour and potato, you’ll be happy because it’s easy to replicate and make great gnocchi every time. – Put flour onto a bench or marble slab, make a well in the centre and put the warm, minced potato into it. – Add parmesan and work into flour. Push flour away if there’s too much. 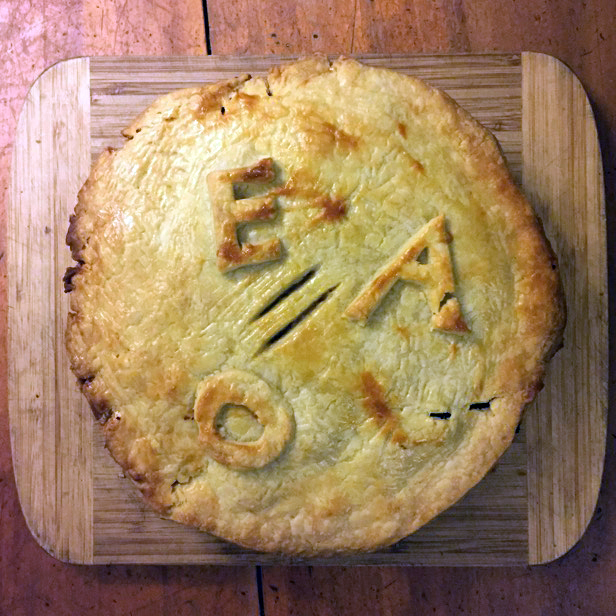 The potato and flour have to balance each other and amalgamate. – When the dough is ready roll, with your hands into a sausage shape. Don’t get too much heat from your hands into the dough. The secret is to keep it light, so don’t over work or press down. – Take the roll and cut off pieces into cushion shapes. Take each cushion, turn it and press your thumb into the side and flip over. Push with your thumb away from you. The indentation allows the sauce to penetrate. 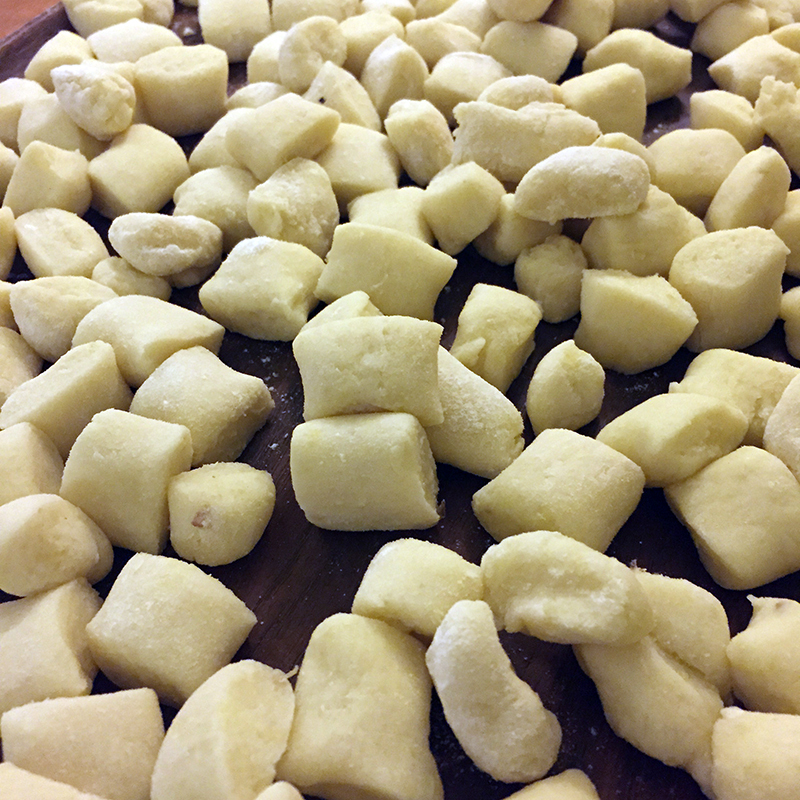 – Cook gnocchi in rapidly boiling water with salt for just a couple of minutes. They are ready as soon as they rise to the surface. Take a knob of butter per person, melt and let brown in a pan. Toss three to four sage leaves per person into the very hot butter for a minute till they start to get crisp. 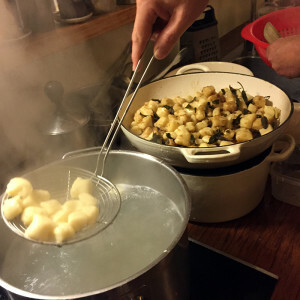 Pour over the cooked gnocchi. I sometimes roll the gnocchi with my thumb but often just cook it directly after cutting as in the pictures above. I also scoop the gnocchi from the pot into a large bowl with a little olive oil or butter so they don’t stick. Then I pour the sage butter over and serve at the table. 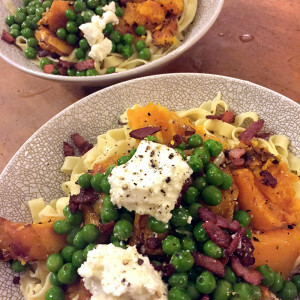 with goats cheese, peas, roast pumpkin and bacon. Home made pasta is unbelievably different to its dried counterpart and only takes 3 minutes to cook. 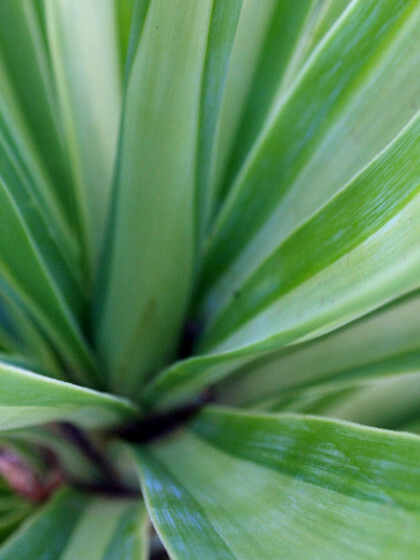 The texture is delicate, velvety and surprisingly easy and fun to make. The choices here are eggs or no eggs. Mietta’s Italian Family Recipes is my Italian cooking standard so here is her recipes for pasta dough with and without eggs. Both are good. – Put flour onto a large table or bench and make a well in the centre. 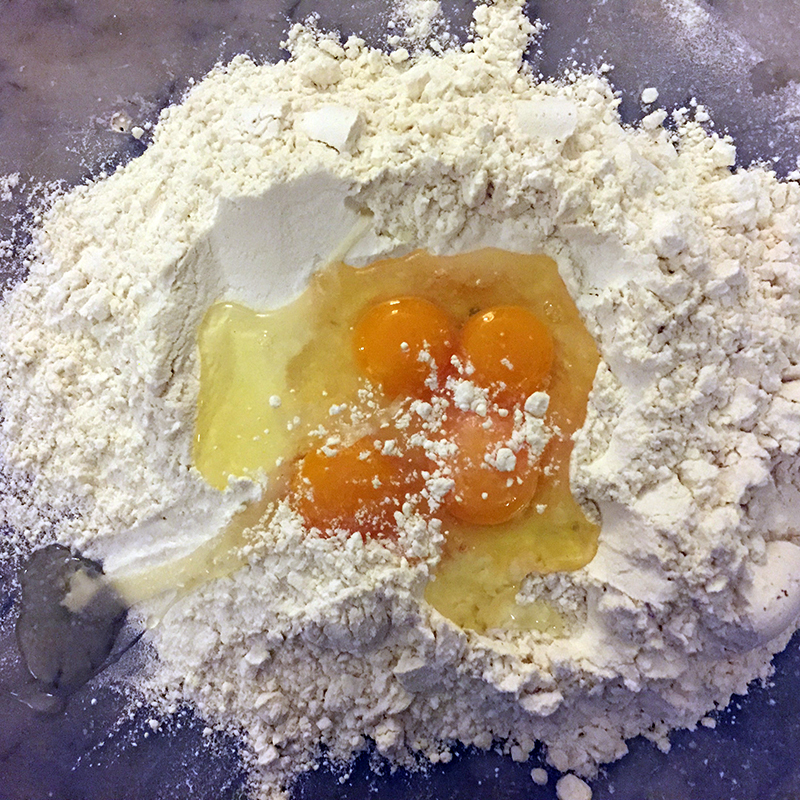 – Break eggs into the middle and make a puddle with your hand, then draw in the flour and let it absorb the egg. – knead, pressing hard, roll out slightly. – Add a few spoons of water at a time, incorporating into the flour. – Knead until smooth and elastic. The dough should be nice and soft. The secret to kneading is to push the dough away from you with the palm of your hand using your full body weight. – Let the dough rest covered for 20 mins. – Break off about a quarter of the dough and leave the rest covered. 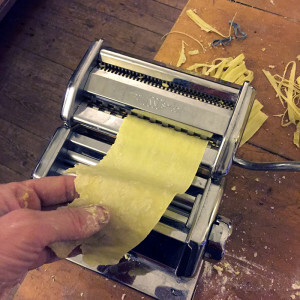 – Flatten the dough sufficiently to feed through the pasta machine. – Fold and turn the dough and pass through the machine at least four times on the widest setting. I like to cut the edges so that I start with a straight section before cutting to size. – Pass the dough through each time turning the knob a notch to reduce the size of the opening so that the dough gets thinner and thinner. 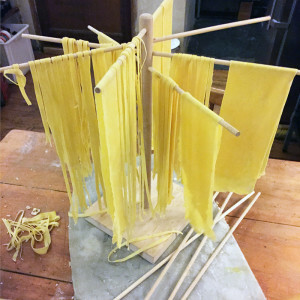 Once you have the flat sheet from the thinnest setting hang it on a chair or pasta drying tool like the one in the pictures above. Don’t let it get too brittle before passing through the cutting section. I usually do all the dough and hang it up then cut one at a time after that. – Once you have all the dough flat from the thinnest setting pass it through the cutting roll or cut by hand. NOTE: There are many videos on YouTube illustrating how to do this. Home made pastry is simple and delicious. Now that I know this I only ever make my own, it takes about 10 minutes, then 20mins in the fridge. Stephanie Alexander uses this recipe for both sweet and savoury pies and I agree it is a great all round pastry. Remove butter from refrigerator 30 minutes before making pastry. Sift flour and salt onto a marble pastry slab or workbench. Chop butter into smallish pieces and toss lightly in flour. Lightly rub to combine partly. Make a well in centre and pour in water. Using a pastry-scraper, work water into flour until you have a rough heap of buttery lumps. Using the heel of your hand, quickly smear pastry away from your across the workbench. Gather together, then press quickly into a flat cake and dust with a little flour. Wrap pastry in plastic film and refrigerate for 20-30 minutes. 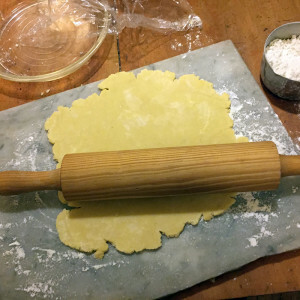 When required, roll out pastry, dusting generously with flour as necessary. Line your required tin and blind bake. Cut down the leeks lengthways to the dark green centre. Slice into rounds. Wash and drain well. Fry leeks in butter until limp in a large saucepan. Put the lid on for the last few minutes. Add chopped carrot and peas to leeks 5 mins before the end of their cooking time. Cut chicken into bite-size cubes. Shake in a plastic bag with flour, salt and pepper. Fry chicken in batches. I do it in a cast iron wok, frypan will do. Cook on high, brown don’t burn. Combine chicken with leeks and veg. Stir well. Set aside to cool. 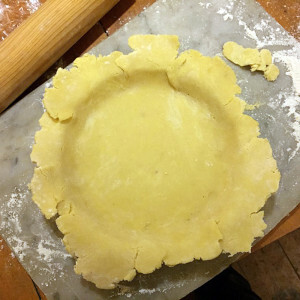 Spoon cold pie filling into pastry after it has been blind baked. Put back in oven and cover with pastry lid. Cook until pastry is golden. 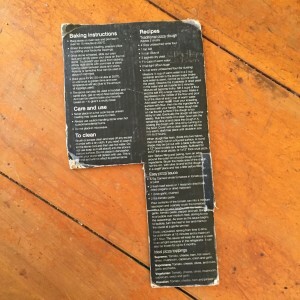 In the past I have frozen the eye fillet in order to slice it thinly. 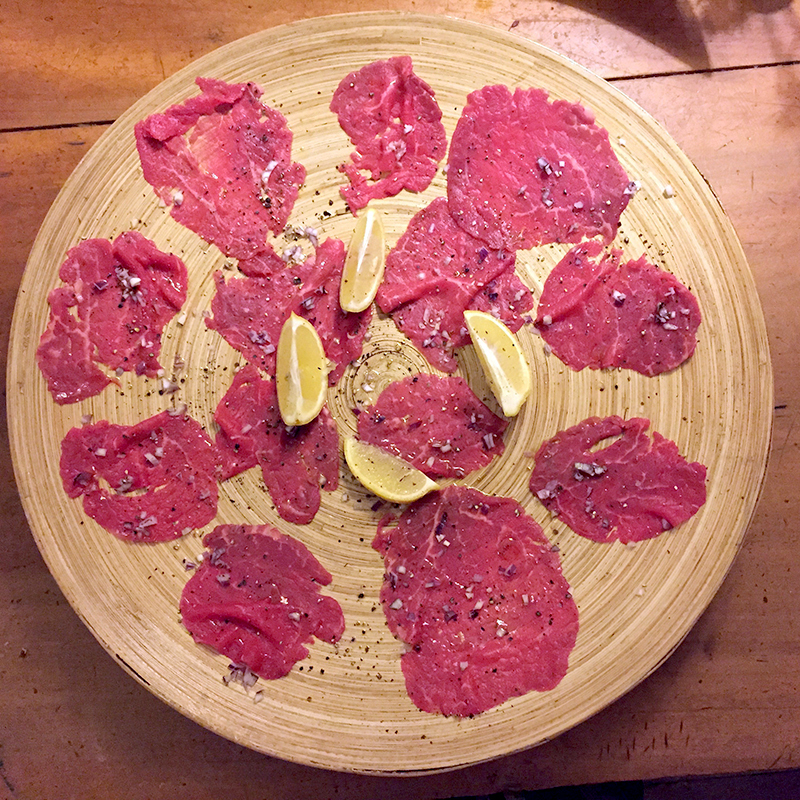 This time the butcher sliced it for me which felt like cheating but was great. I squeezed on the lemon and ate it from the plate while chatting before dinner. One day I had kids in need of afternoon snacks and left over pizza dough in the fridge. 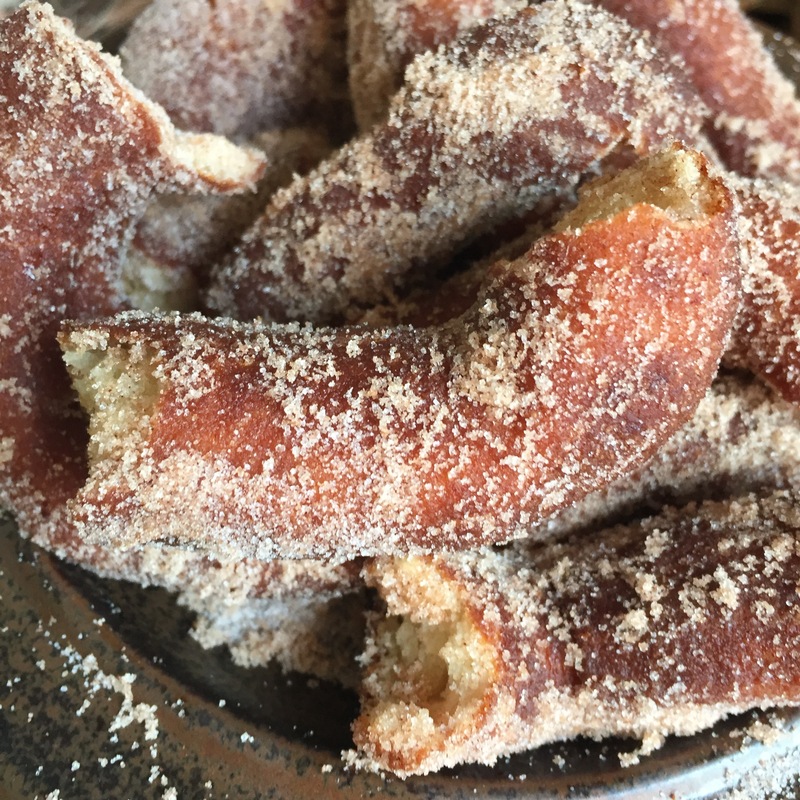 So I added sugar to the dough, which had become slightly sour from being around, and pizza dough became donut dough. 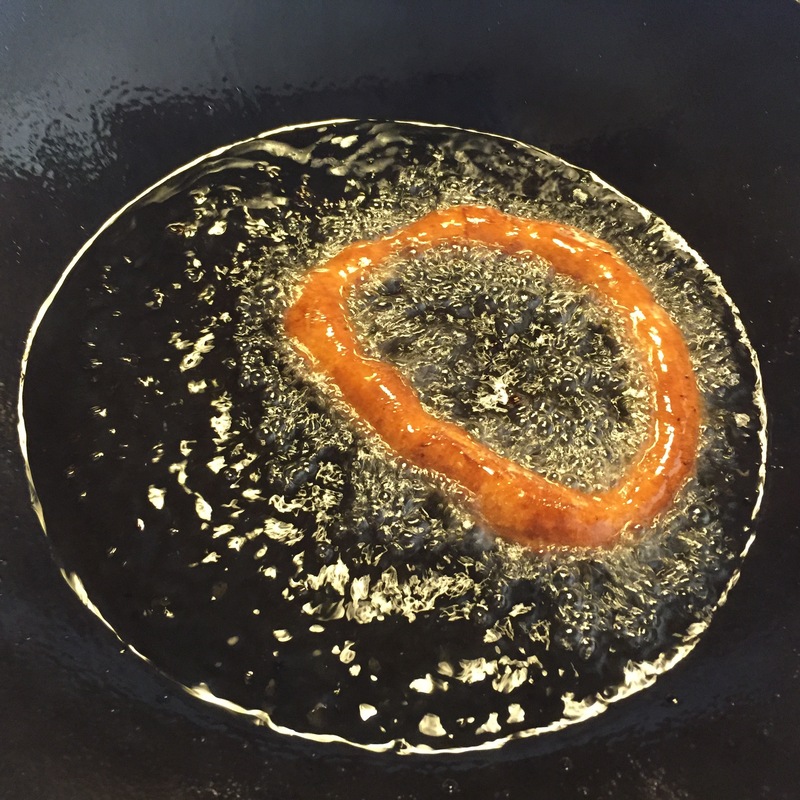 I fried them twice because it was hard to get the centre cooked without burning the outside. 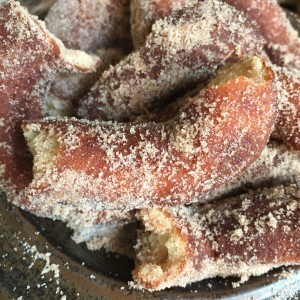 So when drained I broke them into pieces and re-fried them quickly before rolling them in a plate of cinnamon and sugar. I can’t remember the ratio exactly, you can experiment, I would say 1/2 a cup of sugar to the amount below, possibly even more depending on your taste. The adults loved them as much, if not more, than the kids. Note: This is the best pizza dough recipe I have found. I use it to make pizza’s, focaccia’s, flat breads and now donuts. A professional chef who commercially produces pizza dough said it’s the best he has tasted and I agree. I would quote my source if I could remember which box of flour it was from. – Measure 1/2 cup warm water in a 2 cup container and stir in the brown sugar, hot water will kill the yeast and cold won’t activate it. – Dissolve the 2 packets of dried yeast in the water and set it aside for 5 minutes where the mixture will become frothy. – Make a depression in the middle of the flour and pour 3/4 of the olive oil and 1 cup of warm water. 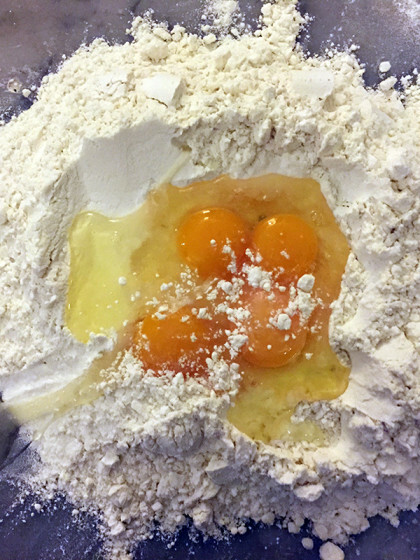 – Dust your kneading surface with flour, then mix the ingredients in the owl wiht your hands. – Place the dough ball on the floured surface if the dough is too sticky or wet. – Eventually the dough will become elastic. – Rub the inside of a bowl with remaining olive oil and place dough in it, coating the dough ball with olive oil by turning it in the bowl. 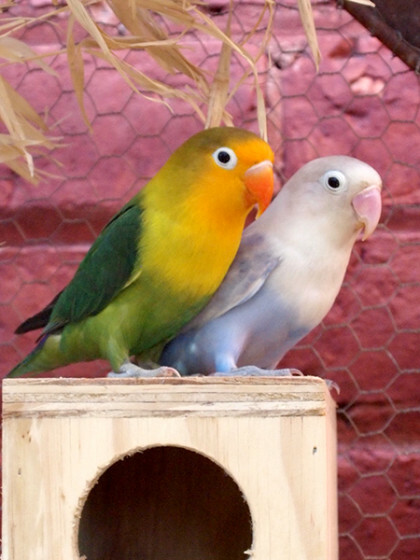 – Cover with a clean cloth and let rise in a warm, draft free place until double in size, (1 1/2 – 2 hours). – When dough has risen divide into two halves then roll each out. Note: The bread machine is not only easier but makes better dough. No one can compete with the mechanical kneading and mixing. It comes out like the pizza shops, elastic, smooth and creamy. Nice to work with. – Put all ingredients in the bread pan in recommended order. – Set to dough setting, if you don’t you will find a loaf of bread waiting for you, as I did last week, instead of dough. 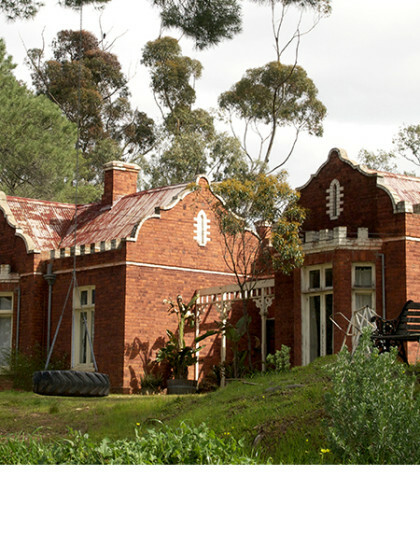 – When finished it’s ready to use. 1. liquids 2. Fat 3. Salt 4. Dry ingredients 5. Yeast. – Roll or push the dough out on a floured surface until it is about 1 1/2 cm thick. 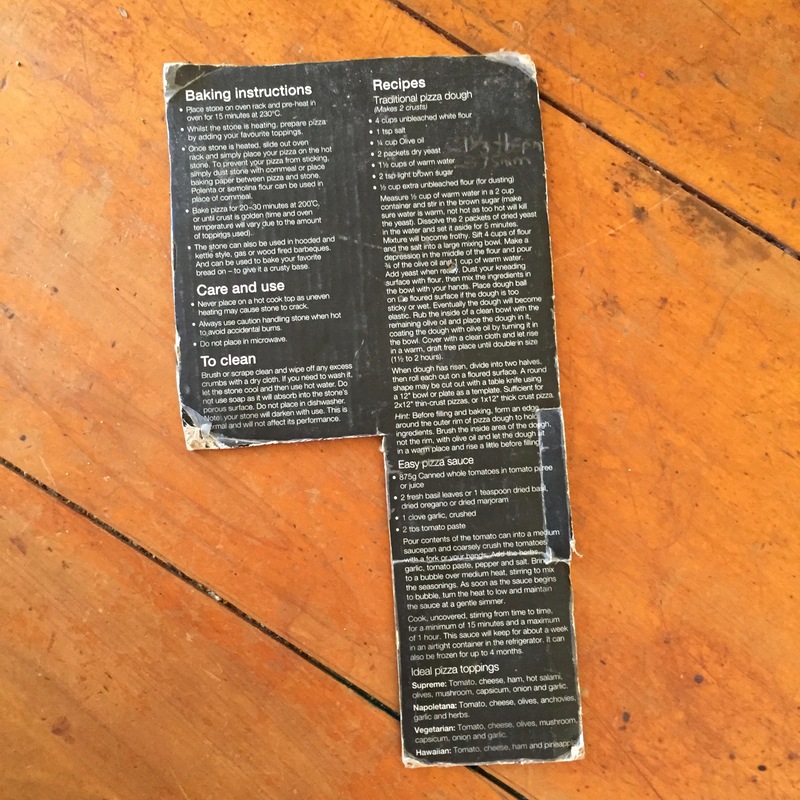 – Cut with large round object for outside shape and smaller for hole, I used a bottle top. 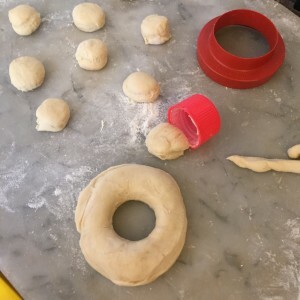 Note: If you want the donuts to be sour you need to leave the dough in the fridge for a day or two or more depending on the temperature and other environmental factors which will determine how sour it will be. I would start with a day and see how you like the sour taste. I like it and so leave my crepe mix for a long time in the fridge too. It’s better for you as well because the ingredients have started to ferment.